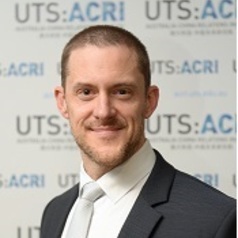 James Laurenceson is currently Deputy Director and Professor at the Australia-China Relations Institute (UTS), University of Technology, Sydney. He has previously held appointment at the University of Queensland, Shandong University (China) and Shimonoseki City University (Japan). His research focuses exclusively on the Chinese economy and has been published in international, peer-reviewed journals such as China Economic Review, China Economic Journal, Journal of Chinese Economics and Business Studies and China and World Economy. The Australia-China Relations Institute (ACRI) at the University of Technology, Sydney, was launched by Foreign Minister Julie Bishop in May 2014. The Director is former Foreign Minister Bob Carr. The aim of ACRI is to illuminate the bilateral relationship across political, economic, cultural and other dimensions.